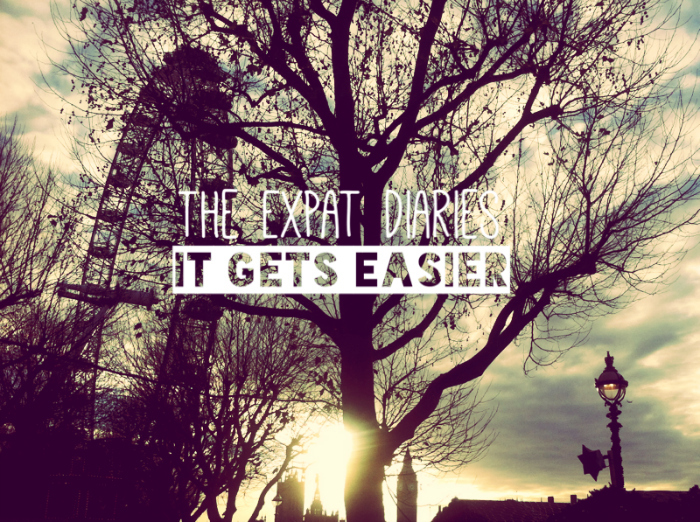 The Expat Diaries: It gets easier. I instantly felt like myself in London. Like her and I were a good fit together. I know this city isn’t for everyone. It’s too big. Too busy. Too expensive. And I get it. London is a struggle. You’re going to have to sacrifice location or a sizable portion of your pay cheque to find somewhere to live (probably both). There are hundreds of other people vying for every job you apply for. Your hair is almost definitely going to get ruined by the rain. Every. Damn. Day. And I’ll doubt I’ll ever make sense how all her meandering streets connect with one another. And if I’m honest, I spent my first couple of months as an expat uncertain if I could make it in this city. I was applying for jobs I was overqualified for out of desperation. I was lonely and uncertain of how to meet people I had a genuine connection with. I felt pulled by situations back home and worried that it was selfish of me to stay. I wasn’t sure if I’d made a mistake paying so much rent every month. I just wasn't sure. But, all the same, London lit me up. Walking down the street I often feel overcome with joy just being here. I become full to the brim with gratitude and excitement. So for a while, I was just feeling this constant tension. My heart knew that I was in the right place and I was committed to making it work. But I couldn’t ditch the nagging fear. I was putting so much pressure on myself. I wanted everything to come together right now so that I’d be certain. Fast forward to today. I’ve been here for five months and now I know, it just takes a little time. I have a job that I love, doing what I’m good at, for an organization I feel passionate about. On Friday I celebrated my birthday with an amazing group of friends – and there were others who couldn’t be there but sent all their love. I’m finding a tribe who gets me. Who supports me. Who pushes me to go further and do better. I’m learning how to stay connected to home in meaningful ways while being true to my dream of living here. Everyday I’m gaining a better grasp on how this city’s put together and carving out a piece of London that feels like my own. Whereas, in the beginning, everything here felt like a struggle (an exciting struggle, but a struggle nonetheless), these days things are easier. Possibilities are opening up where before I only saw obstacles. All this to say, if you’re at the beginning of your expat journey, hang in there. The inner turmoil, the uncertainty, the struggle, it’s all natural. Keep putting yourself out there. Seize opportunities to meet new people. Explore. Go on adventures. And just trust, it’s all coming together. And if you ever have any questions, or need a cheerleader, just let me know.